They zoom and zip through the air, drawing wide, sweeping arcs--and then instantly change direction. Close up, they look unreal, with ethereal wings, thin bodies and shiny, almost metallic eyes. Their aerial acrobatics can be hypnotic. Plus, they eat mosquitos and gnats and other summer pests. Dragonflies are therefore most welcome in my yard. It's hard to try to follow them when they speed through the air, but every once in a while, one of them stops to rest. 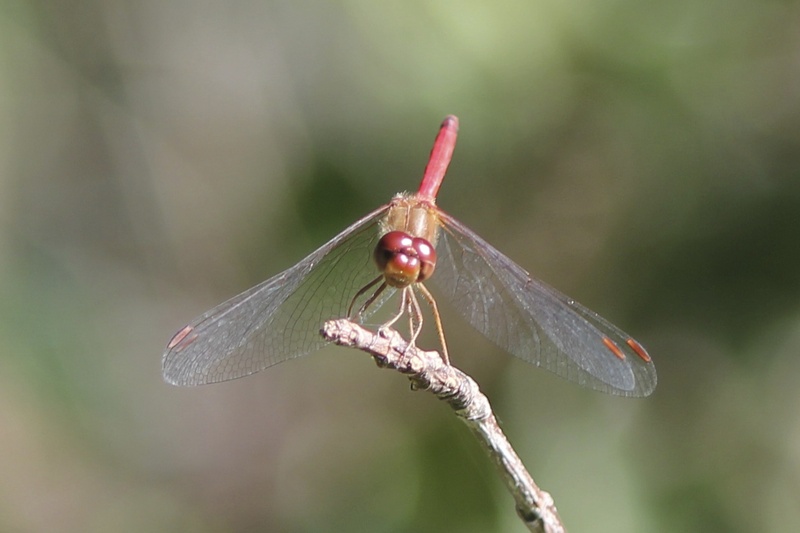 Nearly always, it will land on a stick or the tip of a flower. And, if I'm lucky, and I have my camera in hand, I can take a picture or two. 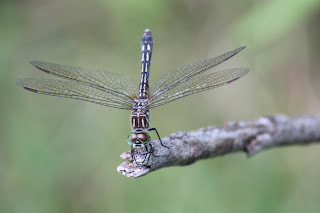 Twelve-spotted darner. This is a female, because there are only black spots. Another twelve-spotted darner. White spots mean it's a male. 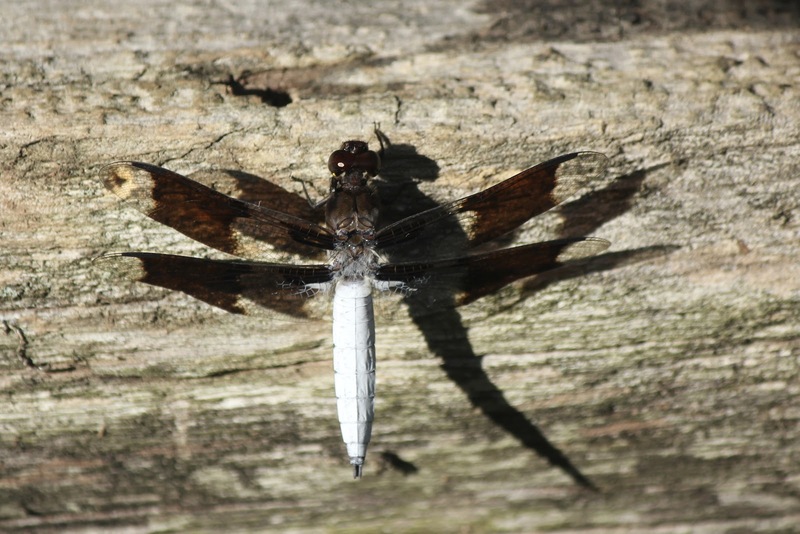 Male widow skimmer. Again, white spots tell me he's a he. 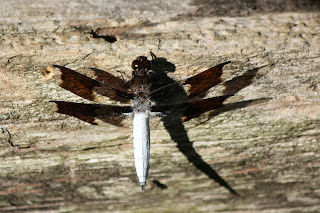 Common white tail. 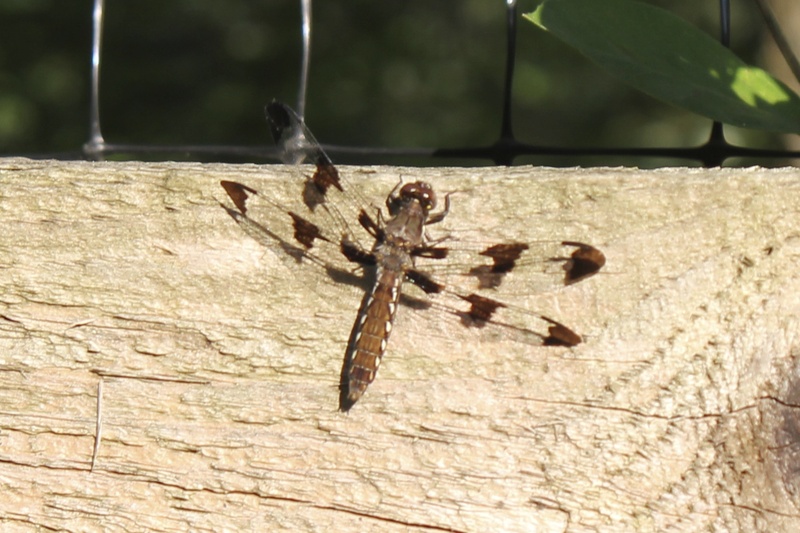 Taken in the harsh sunlight of a late summer afternoon, it's almost had to tell which is dragonfly and which is shadow. Harlequin darner. The eyes on this guy are almost creepy--like a cyborg. I consider myself lucky to be able to see--and identify--some of these fascinating creatures. And doubly blessed when they stop long enough for me take a picture. A few weeks ago, I saw a dragonfly dart by me and land a few feet away on one of the sticks that serve as a fence border for my garden. I had my zoom telephoto lens with me, so I stayed very still and started to snap a few pictures. As I stood there, the ever-present gnats started their officially required orbit of my head. Even though they were annoying, I didn't swat them away, as I didn't want to startle my subject. 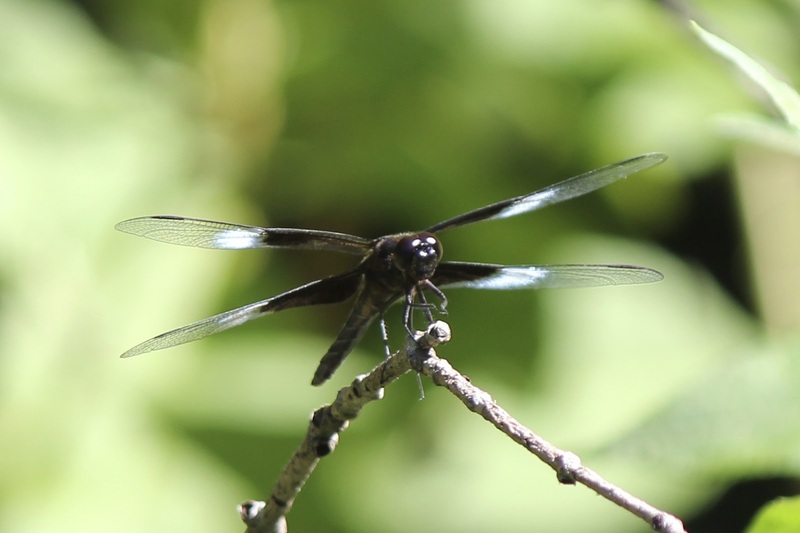 Suddenly, the dragonfly took off, flew around my head, and landed back on his stick. I took a few more pictures. He flew away, circled my head. And landed on the same stick. And then he did it again. Looking through my viewfinder, I could see his little mouthparts moving. An "aha!" moment: he was munching on my gnat cloud. So I offered him a deal. I'll stay still and attract lunch. As long as he continued to pose for me. 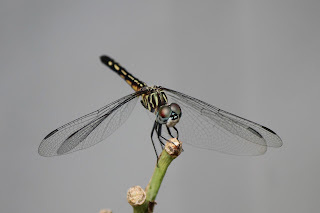 Here are some of the photos of the modeling session with my friend the Harlequin darner. Some folks work for peanuts, some work for gnats. "Yes, I believe we have an understanding." Many dragonflies, like the Harlequin here, rest with the wings forward. 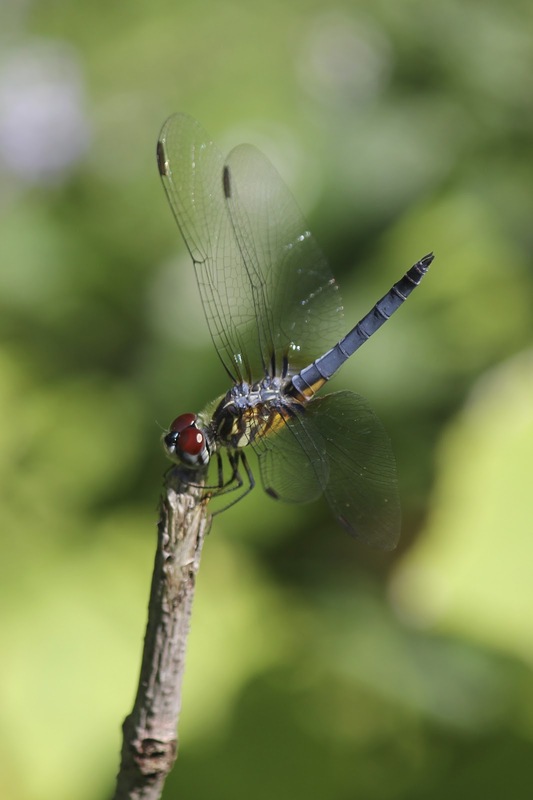 When the wings are forward, they are also often flattened against each other--not that photogenic. Posing with all four wings in view, just after landing. 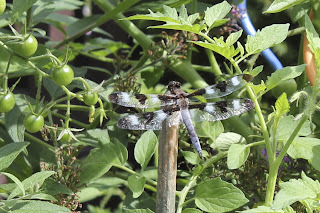 When I first started taking pictures, I didn't realize how many different species of dragonflies had come to visit my yard and garden. 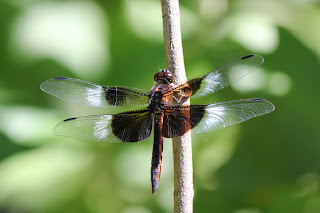 I had lumped them all into the generic "dragonfly" label. Getting up close and personal--through my camera lens--has allowed me to get to know these fascinating creatures even better. They are quite welcome guests--and I'm happy to serve them mosquito hors d'oeuvres, gnat dinners and no-see-um desserts any time. 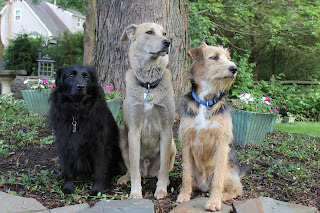 Last week, I wrote about the challenges of taking a good picture of three dogs. This week, I'll feature some of my successes. The dogs are sitting down or lying down close to each other. Nobody is making goofy faces, sticking his tongue out, or licking her nose. No weird backgrounds affect the composition. Everyone is actually looking at the camera, or at least looking somewhere together. The photographer (that would be me) manages to focus on the dogs and not shake. When Tucker was still a puppy; he's smaller than Lilah in this picture. On the sitting wall in the shade garden. 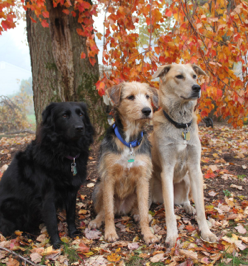 I swear this looks like the doggy version of an album cover for an indy rock band. Which one is the drummer, which the lead guitar and which the singer/songrwriter? One of my absolute favorites. Even though they're not looking at the camera, I just love the color and composition of this one. Sometimes the best pictures are the candids. This is one of the reasons I keep a camera at hand as much as possible. Then I can catch a moment. One of the easiest of those moments happens nearly every morning. The four of us (Lilah, Jasper and Tucker) head out of the bedroom and down the stairs. Often the dogs stop at the top of the stairs and ponder their day before heading down. Usually I sit with them, but sometimes I go on ahead and they wait before joining me. On this day, Athena stuck her head through the bannisters at the last second to see what was going on. Photobombed by a cat. Another place to catch three dogs together is looking out a window. If one dog sees (or smells) Something and feels the need to Discuss it, all of them have to go Check It Out. And contribute to the Discussion. These pictures often wind up taken from behind, but sometimes the view of wagging tails says as much as happy faces. Someone is coming to Visit. The Welcoming Committee awaits. Looking out at the back yard. There was a Squirrel. Or maybe a Deer. We also watch when people leave. And then we're a little sad. 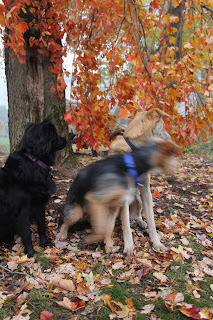 I can also sometimes catch the dogs in action, though I rarely can get them all in focus. And sometimes I catch them in inaction, resting after a strenuous Squirrel Hunt. I couldn't have posed them like this if I wanted to; these just happen to be their favorite places to hang out and rest, though rarely at the same time. Lilah, Tucker and Jasper share a (short) break between games of Chase and I Have the Stick and You Don't. After an early morning walk, home looks extra welcoming. Anybody who has ever tried to take a picture of a group of people recognizes this experience: you tell everyone to "look this way," snap the pic, take a look at it, and Aunt Millie has her eyes closed. Or Uncle Stew looks like he's drunk. And Cousin Bertie was caught in mid sentence with her mouth pursed in a peculiar moue (always wanted to find a way to use that word). So you take another photo--or two or three--in the hope that at least one comes out decently. Now with children, it gets even more complicated. Zach can't stop touching Caitlin's hair. Little Gabby is crying because she wants her ducky now! Eli is busy looking at a bug instead of the camera. And Alex is bored and wants to go home. 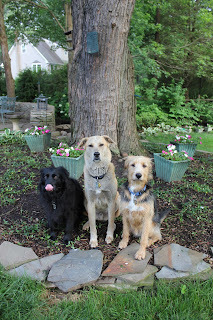 Now try to take a picture of three dogs. That takes it to a whole 'nother level of complexity. It's just a bit of a challenge. The most important aspect of the whole process isn't the camera or the lighting or the setting. It's working with dogs and teaching them important commands like Sit, Stay, Down and Look At Me. Those are basics, and most dogs learn them pretty quickly. The key is getting them to do it under different circumstances. Like next to each other. Or Outside. Where there are many distractions. Like Squirrels. Or Deer. Or Really Good Sniffs. Which is why I might take several dozen--or even hundreds--of pictures in order to get just one that looks good. Sometimes the ones that wind up on the cutting room floor are pretty amusing. And with hundreds of pics of my pups, you start to notice some patterns. The first goal is to get the dogs to sit or lay down. Next to each other. Close enough to get a good picture. Lilah, Tucker and Jasper sitting, but they're a little too far apart. Once I get them sitting together, I try to get them to look at the camera, instead of some other Distraction. This is where the Look At Me command comes in handy. Though Looking At Me isn't that easy when there are so many things that are so much more fun to look at. Sitting, but staring off at some Distraction. Something Else is much more interesting than me and my camera. Jasper is looking at the camera. Tucker is looking at birds. Lilah is looking at a bug. Once I get the dogs to Look At Me, I start taking pictures. That's when other issues show up. Like tongues. Lots of photos wind up featuring a large pink tongue swiping at a black nose. Lilah demonstrates a perfect Nose Tongue. And nearly all of my photo sessions end the same way. With a blurry dog who has just taken off after a Distraction that has proven to be just too Tempting. Usually it's Tucker. Usually running after a Squirrel or some such other fascinating Thing That Must Be Chased. Jasper and Lilah see the Distraction, but Tucker the young terrier Must Get It. Here is a sample photo shoot, showing a typical set of pictures, in my attempt to get just one good one. Pretty background. Lilah and Jasper looking at me. Tucker's got his eyes closed. Three dogs. Looking in three different directions. Wait! Jasper has a bug up his nose. By now we're getting a little tired, so we're laying down instead of sitting. And Jasper is bored. I love Tucker's paw on top of Jasper's--something Tucker loves to do, but it makes Jasper nervous. And it ends with The Blur. And some Jasper tongue. Once again, looking three ways. Though they all seem to have very majestic and serious expressions. Three dogs, looking in one direction. But the wrong one. All three looking at me. And a great big pink Tongue. 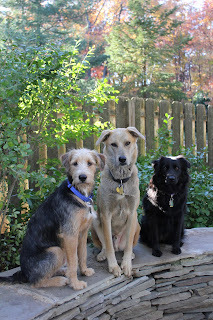 The familiar three dogs looking in three directions. 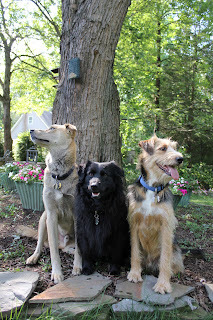 Moving away from the tree, a better picture, with three dogs looking at me. Tongues hanging out, but Jasper is a bit squinty eyed and Tucker has his ears back in an impatient expression. These next few pictures are what happened next. They represent just a few seconds of picture taking. I love my dogs, and love taking pictures of them. I'm not so sure they like it as much; I think they probably tolerate it for the treats. Yet sometimes, we actually succeed with a perfect shot. Tucker expresses exactly how he feels about getting his picture taken. Check out my blog next week to see some of the Good Ones--where everything worked out just so, and I managed to catch three dogs in nice light, looking at the camera, in focus...before Tucker ran away.